Howdy all! Saturday came and it was time to get some work done on Wally the Airstream. As you had seen in our previous posts, We’ve been working on getting the rear aluminum panels put back together and replaced as well as repairing the rear window frame. It was time for us to get started on the windows. 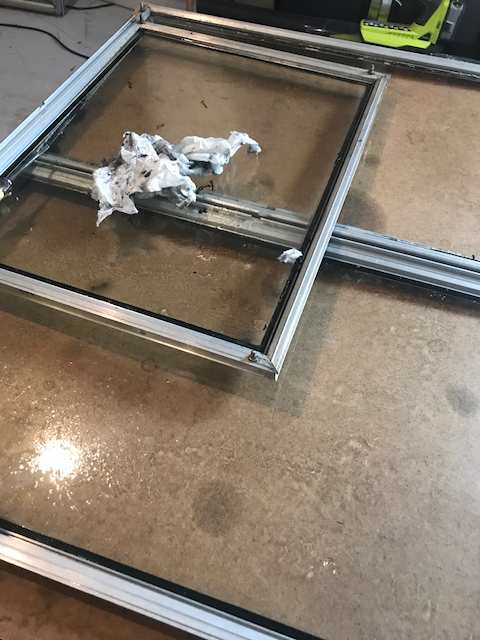 As we’ve mentioned in previous posts, the gaskets around our windows were made from vinyl originally from the factory. At the time it was a great flexible material to use. Unfortuantely, over great periods of time, 59 years for example, vinyl begins to shrink. From the photos below, you can see that at some point the gaps in the gaskets were filled with caulk. So, it’s time to take out the windows so that we can re-seal and polish them up. The video below and shows how to remove the windows so that we can begin to get them in order!